The pancreas and neighboring organs. Pancreas, common bile duct, and small intestine. Pancreatic cancer is cancer in which malignant (cancerous) cells are found in the tissues of the pancreas. Pancreatic cancer is also called exocrine cancer. The pancreas is a gland located deep in the abdomen between the stomach and the spine (backbone). The liver, intestine, and other organs surround the pancreas. The pancreas is about 6 inches long and is shaped like a flat pear. 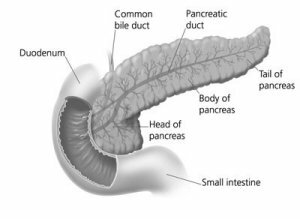 The widest part of the pancreas is the head, the middle section is the body, and the thinnest part is the tail. The pancreas makes insulin and other hormones. These hormones enter the bloodstream and travel throughout the body. They help the body use or store the energy that comes from food. For example, insulin helps control the amount of sugar in the blood. The pancreas also makes pancreatic juices. These juices contain enzymes that help digest food. 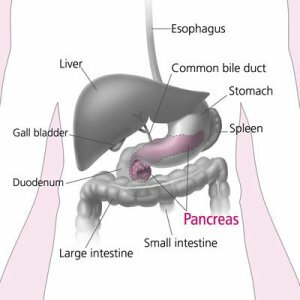 The pancreas releases the juices into a system of ducts leading to the common bile duct. The common bile duct empties into the duodenum, the first section of the small intestine. Who is at risk from pancreatic cancer? The exact causes of pancreatic cancer are not known. Doctors can seldom explain why one person gets pancreatic cancer and another does not. Age. The likelihood of developing pancreatic cancer increases with age. Most pancreatic cancers occur in people over the age of 60. Smoking. Cigarette smokers are two or three times more likely than nonsmokers to develop pancreatic cancer. Diabetes. Pancreatic cancer occurs more often in people who have diabetes than in people who do not. Being male. More men than women are diagnosed with pancreatic cancer. Being African American. African Americans are more likely than Asians, Hispanics, or whites to get pancreatic cancer. Family history. The risk for developing pancreatic cancer triples if a person's mother, father, sister, or brother had the disease. Also, a family history of colon or ovarian cancer increases the risk of pancreatic cancer. Chronic pancreatitis. Chronic pancreatitis is a painful condition of the pancreas. Some evidence suggests that chronic pancreatitis may increase the risk of pancreatic cancer. Physical exam. The doctor examines the skin and eyes for signs of jaundice. The doctor then feels the abdomen to check for changes in the area near the pancreas, liver, and gallbladder. The doctor also checks for ascites, an abnormal buildup of fluid in the abdomen. Lab tests. The doctor may take blood, urine, and stool samples to check for bilirubin and other substances. Bilirubin is a substance that passes from the liver to the gallbladder to the intestine. If the common bile duct is blocked by a tumor, the bilirubin cannot pass through normally. Blockage may cause the level of bilirubin in the blood, stool, or urine to become very high. High bilirubin levels can result from cancer or from noncancerous conditions. CT scan (computed tomography). An X-ray machine linked to a computer takes a series of detailed pictures. The X-ray machine is shaped like a donut with a large hole. The patient lies on a bed that passes through the hole. As the bed moves slowly through the hole, the machine takes many X-rays. The computer puts the X-rays together to create pictures of the pancreas and other organs and blood vessels in the abdomen. Ultrasonography. The ultrasound device uses sound waves that cannot be heard by humans. The sound waves produce a pattern of echoes as they bounce off internal organs. The echoes create a picture of the pancreas and other organs inside the abdomen. The echoes from tumors are different from echoes made by healthy tissues. - Transabdominal ultrasound. To make images of the pancreas, the doctor places the ultrasound device on the abdomen and slowly moves it around. - EUS (Endoscopic ultrasound). The doctor passes a thin, lighted tube (endoscope) through the patient's mouth and stomach, down into the first part of the small intestine. At the tip of the endoscope is an ultrasound device. The doctor slowly withdraws the endoscope from the intestine toward the stomach to make images of the pancreas and surrounding organs and tissues. ERCP (endoscopic retrograde cholangiopancreatography). The doctor passes an endoscope through the patient's mouth and stomach, down into the first part of the small intestine. The doctor slips a smaller tube (catheter) through the endoscope into the bile ducts and pancreatic ducts. After injecting dye through the catheter into the ducts, the doctor takes X-ray pictures. The X-rays can show whether the ducts are narrowed or blocked by a tumor or other condition. PTC (percutaneous transhepatic cholangiography). A dye is injected through a thin needle inserted through the skin into the liver. Unless there is a blockage, the dye should move freely through the bile ducts. The dye makes the bile ducts show up on X-ray pictures. From the pictures, the doctor can tell whether there is a blockage from a tumor or other condition. biopsy. In some cases, the doctor may remove tissue. A pathologist then uses a microscope to look for cancer cells in the tissue. The doctor may obtain tissue in several ways. One way is by inserting a needle into the pancreas to remove cells. This is called fine-needle aspiration. The doctor uses X-ray or ultrasound to guide the needle. Sometimes the doctor obtains a sample of tissue during EUS or ERCP. Another way is to open the abdomen during an operation. When pancreatic cancer is diagnosed, the doctor needs to know the stage, or extent, of the disease to plan the best treatment. Staging is a careful attempt to find out the size of the tumor in the pancreas, whether the cancer has spread, and if so, to what parts of the body. The doctor may determine the stage of pancreatic cancer at the time of diagnosis, or the patient may need to have more tests. Such tests may include blood tests, a CT scan, ultrasonography, laparoscopy, or angiography. The test results will help the doctor decide which treatment is appropriate. Read about how pancreatic cancer is treated.